Engine fluid leaks are a tell-tale sign that your vehicle may need a service inspection. Here at Ross Motor Company, we believe that informed owners can get the most out of their vehicles. Spotting fluid leaks and knowing how to handle them can help you avoid expensive repairs down the road. One type of leak you'll want to watch for is a coolant leak. When a vehicle's coolant system springs a major leak, it can cause the engine to overheat or even be damaged beyond repair. Engine coolants have distinctive green or orange colors. If you notice a large puddle of coolant in front of your vehicle, you should call for service immediately. 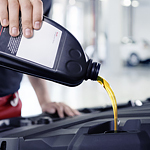 Gradual coolant leaks are sometimes manageable with regular top-ups of your coolant reservoir, but you should consider having the cooling system inspected at our service center.